Uber Eats gift cards are easy to give and always appreciated. Plus, good meals from great local restaurants make great memories, so everyone will always remember how thoughtful you are. Bonus: Uber Eats gift cards are also redeemable for Uber rides. Choose from one of our themed cards or upload a photo. Select an amount that you want to send to that hungry person in your life. Put in a recipient's info and the deliciousness is on the way. From birthdays to sick days to virtual high-fives, Uber Eats gift cards are just right any time of year. How does my recipient redeem the Uber Eats Gift Card? Once a gift card is added to a rides or Eats account, the balance will be reflected in both apps and can be used in either the Uber Eats or Uber rides app, and will update after each order or ride.The gift card balance can’t be transferred to another Uber user. You can't reload a gift card, but you can add up to $1,000 in gift card credits to your account. As you use up your credits, you can add more. How do I use an Uber Eats Gift Card? 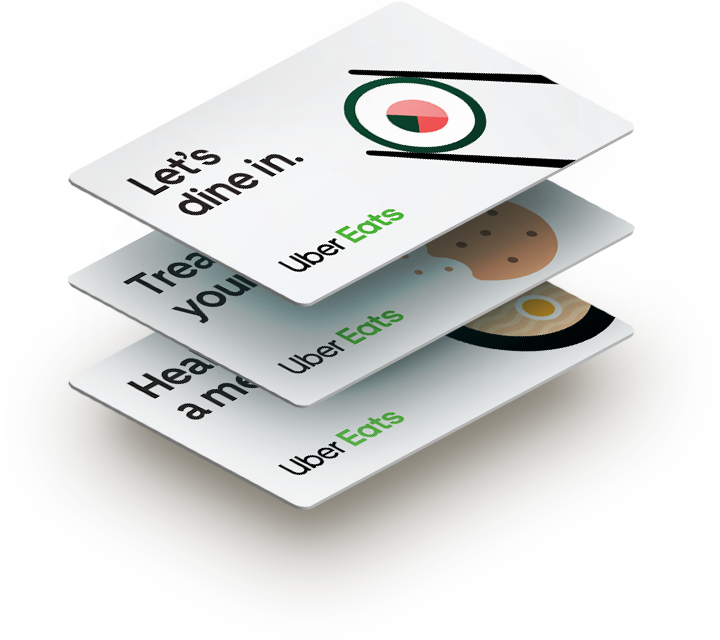 Uber Eats gift cards can be used for Uber Eats orders or for Uber rides. Uber gift cards can be only used for rides or Uber Eats orders in the cou ntry where the gift card was purchased. They can't be used for UberRUSH, family profiles, or scheduled rides. Gift card credits will apply to your next order by default, but you can select a different payment method before you make your request.